Pretty much their attitude towards backers lately, not keeping them informed of schedule slips and whatnot. Plus a string less then mediocre games. I look forward to your boxed game though. The Blackwater Gulch stuff you've done so far has been great (even if I havent gotten around to playing it). I'm also glad you decided to not go with the wild west horror theme right away. Yeah I want to stick to the hollywood historical kind of setting I have going now. I still will be doing the monsters, but now I'm planning do that as a whole separate game / product line rather than a BWG expansion. but both will have the same rules and format as this new board game so everything will be compatible if folks want to mix things up. 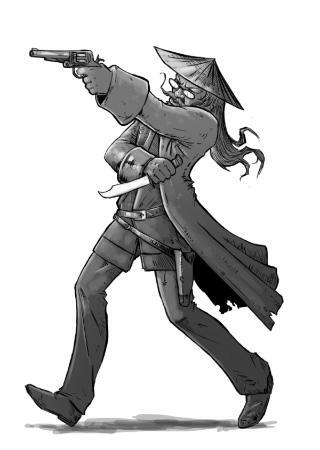 What I'm thinking about doing with that now is having it like an alternate universe kind of thing, but rather than just horror weird west I was thinking a fantasy western would be fun, so there could be dwarf prospectors, hobbit gunslingers, elf bounty hunters, orc wrasslers, etc. 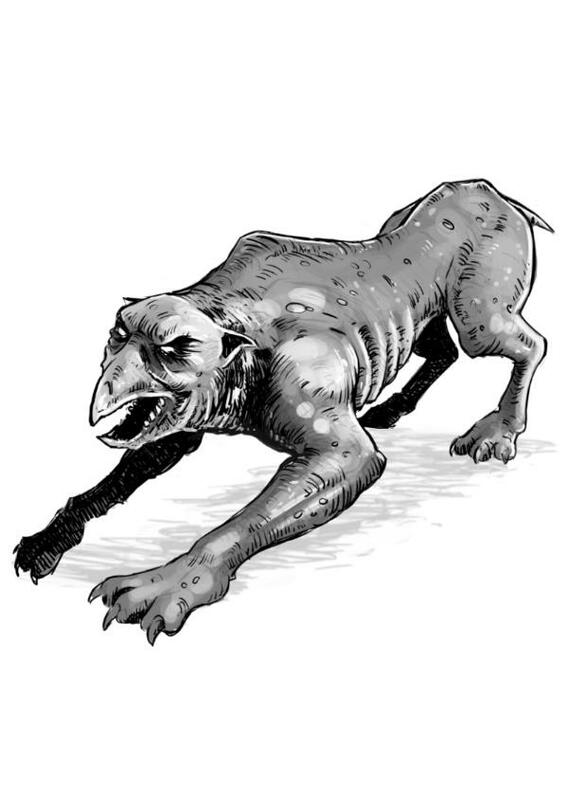 There'd be some western-ified fantasy creatures to fight, but most monsters would be the folklore critters I've been planning like the chupacabra, sasquach, etc. That's all a long way off though, just all ideas at this point. Now that I have the Mechadrome book and cards off to the printers I'll have some time over the next few weeks to get the print & play version done. I got the rules to a place where I like em, and testers have been saying it's really fun I decided to do some adjustments to the game board tiles and go with the same 10" square tiles, but a 8x8 grid of 1.25" spaces, rather than 10x10. This makes the spaces just big enough for the 30mm bases we use on the miniatures. Even though we'll be doing cardstock pawns I still want people to feel free to use their minis instead if they want. And the way movement works, you'll usually just be moving 3-4 spaces per turn anyway, so dropping a few extra spaces shouldn't matter. I've made the final decision to change the game boards to still be 10" squares, but have 8x8 1.25" spaces, rather than 10x10 1" spaces. This is really just to accommodate our models that all have 30mm bases so there will be less crowding and losing track of who was in what space in the middle of a big melee brawl. The plastic stands for the board game characters will be 1" though. 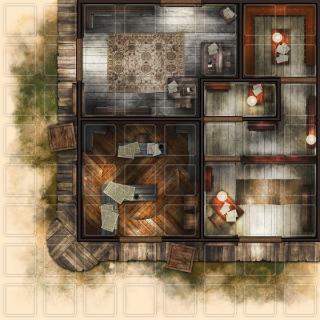 I'm hoping to have some board tiles to show off in a couple of weeks. The shipping quotes I've been getting have been kind of insane :( It looks like just to ship 1000 copies of the game from China to the US warehouse it will cost $3300. I'm checking to see what it would cost to split the shipment and send some the UK warehouse, but I'm betting it will be a lot since it's gonna require a 2nd boat. But we'll see how it goes. I'd like to be able to ship the EU pledges from the EU so it will be cheaper to ship to those backers. Starting on the rulebook now. I figured it would be easier this way as it will give me a more accurate page count for the printer quotes and also be easier to figure out how much extra artwork I'll need for fluff or filler. What I'm gonna do is get that all done and put it together as a PDF so folks can read the final rules and see how the game will look, and also the print and play preview will be based on those rules. I was writing separate rules for that as a kind of stripped down version, but I think it will be better to have one book to rule them all. Also been thinking about the campaigns, at first I was planning to do a big story driven campaign that takes like 10 games to complete, kind of like Descent.. but I think instead I'd rather give players the option to create their own adventures and focus on that aspect more. So I'll have a few pre-made adventures you can choose based on the amount if players you have (1-6) so you can play one of them all right out of the box, or take it a step further designing your own from scratch. I'll have a chart you can roll on to determine which objectives you can place and which tiles they can go on, and we can possibly make that a deck of cards too, maybe for a stretch goal. I decided rather than doing a long pre-made campaign like Descent, I'd rather have the games be quick to set up and play and allow players to create their own adventures from scratch really easy. I'll have a couple of sample adventures, mostly designed to teach the rules. Doing custom adventures makes the game different every time you play. I'm going to put together a few lists to roll on to determine where things go. 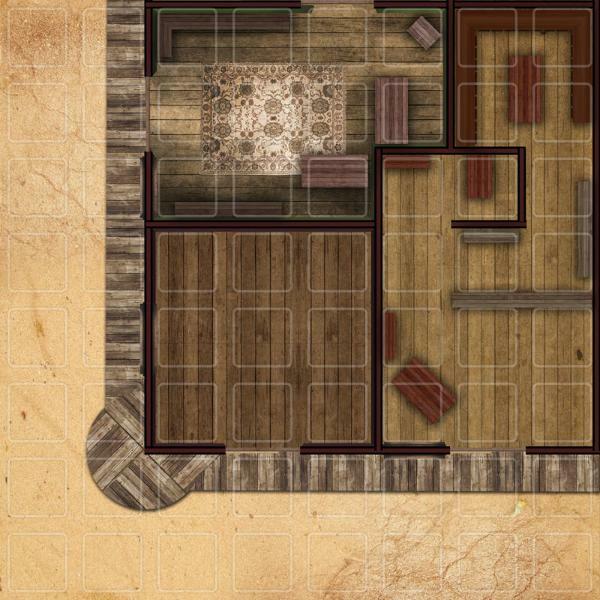 You can either lay out your map yourself in a way that you think looks good, and then roll on lists to place objectives.. or you can roll to randomly choose tiles too. It's pretty simple.. first you roll 1D6 to pick the board tile the Heroes start on, then you roll on that tile's list to see what building they will be in and what side of the tile to use. Then roll again to pick the next tile and location for the first objective, and keep rolling till you have all objectives placed, basically each tile except the Hero starting tile gets an objective. 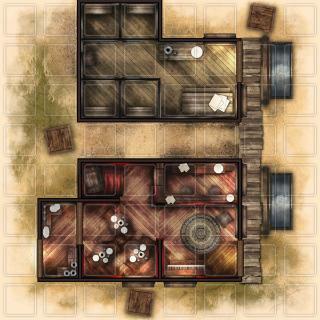 You might have to stop a bank robbery or break up a fight at the saloon, capture an outlaw and bring em to the sheriff, stuff like that there will be 4 tiles for a basic game with 2-3 heroes, and 6 tiles for 4-6 heroes. I thought it would be cooler to have you draw cards to pick your board tiles and objectives, but I can't think of a good way to do it. There's 6 tiles, so that would mean you only get 6 cards and a list to roll on each one? We can't have 1 card per objective, if there's 2 objectives for each side of the tile, you're stuck if you end up drawing 1 for each side. So rolling for everything seems like the best way to go. Starting to get the board tiles done. Here's a WIP of the first board, not done yet though. 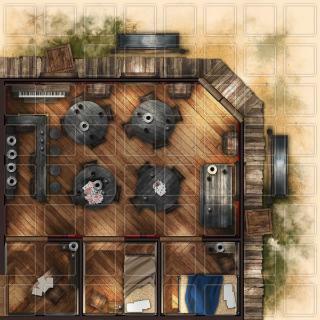 Still need to add a lot of details, shading, obstacles, doors, etc. What decided to do with the doors is all boards will have the doors closed, since everyone looks up tight when the bullets start flying. So if you want to go in a building you have to dive through a window slowing your movement by 1 space, or use an action to bust open a door and then it will stay open for the rest of the game. We'll have a little "busted open door" template you can place there when you kick it open. These are actually just side 1 of the first 4 titles. The box will have 6 tiles in all, for a total of 12 different areas. Is there a reason why your putting so much space in between squares? If you let the squares run into each other it looks like you could get away with either smaller tiles or a 9x9 tile. Yep, it's for the miniatures, they have 30mm bases so 1" squares would be too small. Well, they kind of fit, but if you end up with a big melee they won't all fit together. So, the tiles are 10x10, with 8x8 squares.. the squares are 1", but the extra space makes them all 1.25". I could have made it more like a grid but I thought the faded white space outlines with the gaps between them looked nicer, and it's easier to delete a square where the obstacles are to show you can't move there, like the crates. The way I was planning to have you set up the board to play is you'll roll on a table that tells you which boss you'll be up against and where he'll be, then you just add extra board tiles to finish the map. I decided what I'm gonna do now is just use objective cards after all, but it's more for placing objectives & spawn points. 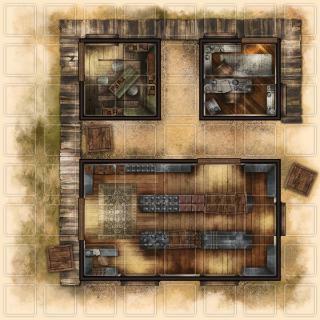 There's 1 objective for each hero, the first objective is the location of the primary boss, other objectives are basically spawn locations for henchmen, and the cards will tell you the name of the building, or if it's a room that's part of a larger building, like the back office in the Saloon. So there's gonna be 4 different decks... around 20 objective cards, 20 encounter cards, 20 fame cards and 40 loot cards. Also going to change the rewards slightly, you'll get 1 loot card for completing an objective, and 1 loot & Fame card for beating a boss. Why not just make the squares bigger then... To me it looks odd and it's different from pretty much every other game that uses tiles out there. I thought that made it look a little fancy But good point. I'll try it with just regular lines and see how that looks. That might be easier anyway, since I wanted to have a dotted line to show where the windows and other obstacles like fences will be. Well I tried it with the full squares .. does look better So I'll probably do them like this. 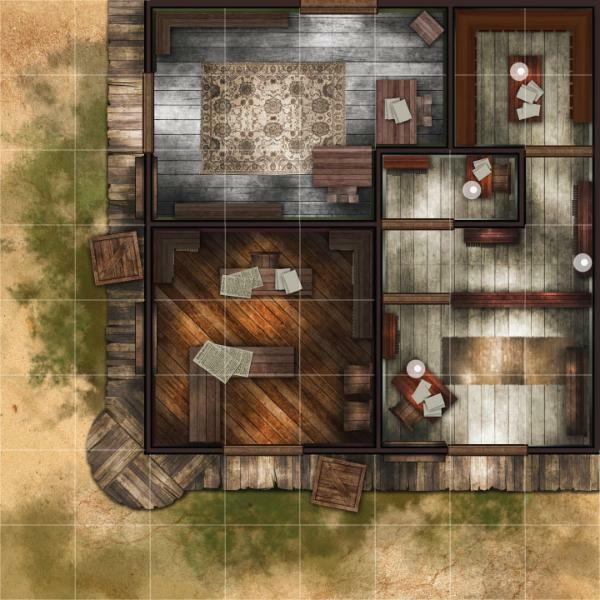 I'll probably put something in the rules saying the white lines are where you can freely move, heavy brown lines are impassible walls, thick tan areas are doors. I'll probably still do the dotted white line over the windows so it's easier to see where those spaces are. The full white squares detract much less from your nice artwork then the boxes did. Been giving some more thought to the Heroes and I think I may remove the infamous versions of the characters.. so all of the heroes will just be the basic level, and the flip side of your hero card will just be nice art and a character bio. This was mostly because it doesn’t seem to make the Heroes much stronger, on paper it seems nice but when you actually play it doesn’t really seem to help much. And you can learn better skills just by completing objectives anyway. Extra HP is nice, but I thought I could just add in some extra stat-booster fame cards as well, instead of just making them all skills. I’m also going to change Fame Cards to be where instead of your Intellect being your max, instead Int will be how many cards you can draw when you complete an objective, and then you get to keep 1 and discard the rest. So that would also simplify the game types, instead of saying “decide if you want to play an infamous game or campaign game” .. you’ll just set up and play a regular game with the characters out of the box, and I’ll have separate campaign rules that are more like a RPG, where everyone builds their hero from scratch… but I may save that for an expansion or PDF add on rules or something like that, depending on space, so the core rules don’t get too bogged down. Some new stuff happening … After having some long chats with testers and friends that have been trying the game out we’re all kind of coming to the same conclusion that having lawmen fighting outlaws just feels too much like the skirmish game, and not like an “adventure” game. As development moved along the game turned into a kind of game where a few tough guys fight off a horde of wimpy guys that are really dangerous if you let them get too close, and it just feels like they should be killing monsters to get loot, instead of a lynch mob of outlaws. 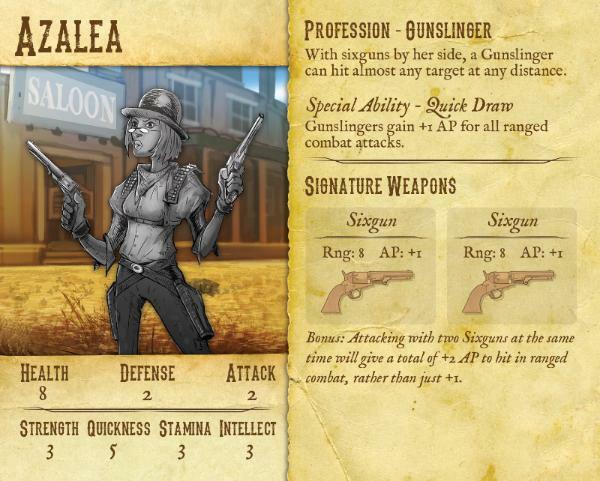 So, we’ve come full circle and are now going back to the original weird west setting. The rules and such won’t really be changing at all, just the names of the enemies. Instead of bandits and crooks, they’ll have the same stats but they’ll be called Chubacabras or Skinwalkers. The theme just fits the gameplay much better. And also I’m going to be changing the name of the game. I want it to be a separate product line, though both games will still be compatible. The new name will be Bandits & Badlands. The contents of the core game is going to change slightly. Still 6 heroes, but the game will be designed for 2-4 heroes so you can choose who you want to play. There will also be 4 copies of 4 different minions (instead of henchmen)… jackalope, chubacbra, cactus cat and cave beasts. Mid level beasts will be called Fiends, and there will be 2 copes of each… skinwalkers that will be werebears, werebats, werecats and werewolves. And we’ll still have 6 different bosses, Alpha versions of each skinwalker type, and then there will be a sasquach and a Barrens Devil. I’ll be finishing up the prototype kit in the next few weeks if I can pull myself away from Dragon Age. It may take longer than expected to get all the new beast artwork done, but we do have a good foundation based on what we had done from before and still on track for Kickstarting in January if all goes well. So that’s where we’re at now I’ll post the updated rulebook PDF once I get it done. Weird West kills my interest in the game... It's a genre thats gotten alot of attention in the last year or so. Sorry :( We just have so much done for it already, it seems silly not to go forward with it. I will still be making the historical version I was planning, currently it will be a PDF update, with some print-on-demand cards from the game crafter, since all you really need is some different encounter cards to draw for different enemies, the rest of the game will be the same. I’d do it as a fully printed expansion kind of thing if the kickstarter campaign went really well. But now that I’ve been using it for Mechadrome I like how the game crafter works, real easy to get things like extra custom decks done for expansions without having to worry about printing thousands of copies and worry they won’t sell enough, and they’re the same high quality black core cards you get from the “real” printers. And with the "Game Crafter Seal of Quality" I'm definatly out. I've got enough junk they've printed that I wont support anything that's produced by them. Their work is beyond junk. I meant I'd be using them to print some different character cards and stuff, not the full game That's going to be a high quality big boxed game printed in china and shipped here on a big boat like everything else. The boards and box are going to be thick linen cardstock, really the same thing you'd get from a Fantasy Flight game or other similar brands. Is TGC that bad? I've never gotten any of their games, but I used them to print the cards for Mechadrome and they came out nice. And Game Salute used them for the BWG character cards too. I don't think I'd don't think I'd ever use them for anything else. Wargame Vault is another option for POD cards. I thought print on demand cards would be a good way to get all of the original gangs included in the game, without driving the costs way up. Basically my view on Gamecrafter... You might design a game that mechanically and art wise I love, but component quality is very important to me. Gamecrafter can take a game I might potentially love and turn it into a game that gets thrown on the trade/give away/throw away pile. Oh .. hmm. Yeah quality is important to me that's why I'm getting the game pro printed and all. I really, really hate playing with cheapy components. What I'm planning to do is have the boxed game, and then a bunch of Beast or Gang packs, each would have the same contents, just different themes. The character pawn sheets are designed to fit 6 pawns that you punch out, each pack has 2 sheets. So for example, a Werewolf Beast pack will have something like 6 chubacabra minions, 3 werewolves, 1 werewolf alpha, 1 other big monster, and 1 new hero. A gang pack will be similar, for the Vigilance Committee for example there will be 6 no-name henchmen (deputies), all 5 characters from the original gang, plus 1 hired gun. And then you'll also be able to use the minis instead of the pawns if you want. The problem though is the cost. The campaign will have a $20k funding goal, but we're basically gonna need a stretch goal of $10,000 for each expansion pack, and to be honest I don't think we're going to unlock a whole lot of those based on previous campaigns. So, that's why I was thinking some printable PDF hero cards and POD encounter cards designed to be used with the existing minis would be a good way to get some of those gangs working with the board game. I'll have PDFs for each and every gang member that you can use as a hero, but it's just if you wanted to use a gang as villains & henchmen then you'll need to draw encounter cards for them. So, I’ve been dragging my feet a bit with the development. Holidays are partly to blame, and I’ve also been waiting on more artwork to come in. I have the rules more or less finalized now. One major item that we decided to drop was the Fame / Skill cards. Now, there’s just 1 deck of loot cards and 1 deck of Encounter cards. We have 3 levels of enemies… Minions are the wimpiest, and most numerous. Fiends are a little tougher, and Bosses are the toughest. When you set up your map, you will have 1 spawn point for each hero, in addition to the primary objective for the adventure. The heroes start in the middle, the spawn points are in each corner. Heroes have to clear out each spawn area / hive / den before they they can tackle the primary objective. Each turn, you draw 1 Encounter Card for spawn point, and it tells you what kind of villain will appear there. Minions are like cannon fodder and fairly easy to kill, but don’t give any rewards. Fiends give 1 loot card to the Hero who killed it, Bosses give 1 card to every Hero. Each hero starts with 1 Heirloom weapon, that they always have no matter what. Then, they can equip up to 2 loot cards (or 3 for bounty hunters). Loot cards will be divided up by rarity.. so common weapons will have a white border and will be like your basic pistol or rifle. Uncommon items will have a green border and they will be more powerful items. Rare cards have a blue border and usually have a special ability attached to them. And unique items are purple and are the most powerful. The ratio will be something like 10 common items for every 1 unique, 6 uncommon or 3 rare, so that makes 20 different cards for each loot pack. The core game will have 60 loot cards, and the gang packs will have 20. Then there will also be 1 Encounter card per villain pawn, 30 in all. 16 minions, 8 Fiends, 4 Bosses, plus 2 extra special bosses. We've also dropped a few attributes. Strength and Intellect were kind of useless. Now you just have HP, Attack, Defense, Speed and Actions. All attributes start at 1, and Heroes get 12 points to spend raising them. For Villains, minions will have 5 points, Fiends 10 and Bosses 15. Been working a lot lately, getting the rulebook text finalized. Starting to work now putting the test pack layout together and the cards that I'll be getting printed up for the prototype. I'm hoping to be able to send that all out by the end of next week. Here's a preview of the Hero Cards. The core game will come with 6 Heroes (to keep costs down), but I have 12 here for now.. we'll see which ones the testers like best and the other 6 will go in a separate Hero Pack stretch goal. Actually have 6 more on deck as well. These are the tarot sized cards, and just B&W art for now but that will get colored later. the flip sides will have the full body art plus a little bio. I registered just to say: This game looks awesome! And also to say: Badlands is one word, not two. Thanks Still a lot of work to do. I'm putting together the encounter cards now. Thinking of doing something different with the hero cards... and rather than having a bio on the flip side (I can put that in the rulebook), I'd still have 12 heroes, but there would be 6 cards, with a different hero on each side. Kind of as a way to imply that there's some mortal enemies that will never be found helping each other. Almost every hero is from a different and often rival gang. For the name, I was trying for clever wordplay there. The Badlands is a place/region, and could be good for a wild west setting, but in this case it I'm going for the literal meaning.. as in the land is bad.. more like cursed in this case. I see your angle about certain gangs never cooperating with other gangs, but you could also put gang alignments in the rulebook & let the players use whichever hero they wanted against whatever other hero they want. Sometimes a lot of the fun is in "what-if" scenarios where the white-hats and the black-hats fight on the same side, which you would be restricting by doing differently-sided hero cards. Personally, I would get annoyed if I bought a game that forced my hand into different affiliations via limiting the physical ability to use the cards as I saw fit. But I still like your idea of presenting gang alignments somewhere somehow, likely via a rulebook section. I see your point with the name now, I can dig it!